Tonight was the second meeting of fp-syd, the Sydney functional programming group. We had a much more focused group this time with 24 attendees. First up I gave a short talk on a data structure I had come up with for handling data in a text editor. This data structure was very much inspired by the book, "Purely Functional Data Structures" by Chris Okasaki. All data in the data structure is treated as immutable which means that it is very easy to store past state and to implement undo / redo. The main talk was split into two parts. 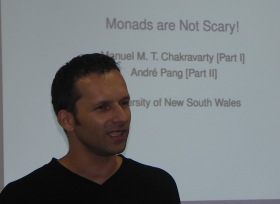 First up Manuel Chakravarty gave a talk titled "Monads are Not Scary" and he gave us all an excellent introduction to the topic which I'm pretty sure has convinced all the monad skeptics in the room that monads really aren't anything to be afraid of. 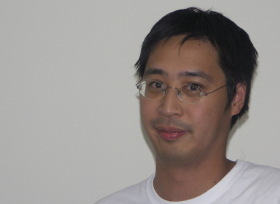 The second part of the main talk, was presented by Andr� Pang who built on Manuel's monad introduction and covered Haskell's Parsec monadic parser combinator library. This too was an excellent talk which explained what seems to be a really elegant tool. Since the group this week was well over 20 people, we are going to have to look for a bigger venue. Dave Peterson of Orbitec has been a great host for the last two meetings and we would sincerely like to thank him for making his offices available for this bunch of crazy people.